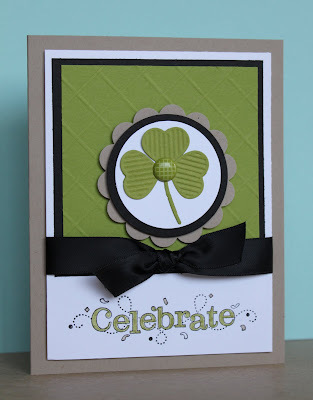 Just Julie B's Stampin' Space: Celebrate St. Patrick's Day! Here's a card I made the other day (when I got my new Diagonal Plate for the Simply Scored). I made a shamrock out of three hearts die cut from the Fashionable Hearts Embosslit. 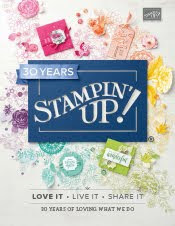 And I decided to use the Celebrate from the Sale-A-Bration set Outlined Occasions. I used Lucky Limeade for my St. Patrick's Day green! And here's a close up of the shamrock. If you look closer at the Lucky Limeade background piece, I used the Diagonal Plate on the Simply Scored tool to create a criss-cross embossed background! Kinda fun, huh?! I like the addition of any kind of texture to a plain colored background. So who says you need to have any St. Patrick's Day stamps to make a St. Patrick's Day card?! Great St. Patti's Day card Julie. I love that you used the new diagonal plate on it. I'm waiting for mine to come and anxious to try it out! Thanks for sharing. Beautiful Card Julie! I hope you don't mind but I did share your card on my pinterest.com board. I hope you don't mind. You might get some more traffic to your website because your website is listed. Thank you so much for sharing!! Sneakin' a Peek for Friday! A Cute New Little Box! Do You Plan for Meals? A Cool Card Box Project! A Very Vanilla Valentine's Day! Stand-Up Lollipop Treat - and tutorial! Stand-Up Double Pocket Picture Tutorial! A Sneak Peek for this Friday's Class!